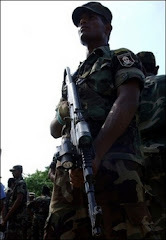 In the wake of LTTE carrying out air raids in Sri Lanka recently, the Indian Coast Guard is planning to set up an Air-Station in Tamil Nadu or Puducherry to deal with any threat from the militant outfit, a top coastguard officer said here on Tuesday. After reviewing the coastal security in the Gulf of Mannar and Palk straits from the Coast Guard Liner base here following reports of LTTE activities, he said negotiations were going on with air force station officials at Thanjavur and other officials at Puducherry and Tuticorin. Once permission was granted to establish the station, the Coast Guard would deploy its aircraft, Dornier or the like, Inspector General and Commander Coast Guard, Eastern Region, Rajendra Singh told reporters. "We are still in the stage of identifying an ideal location," he said. Coast Guard had submitted prospective plan for 2007-08, and for 15 years from 2007-22,in which it had requested the Centre to establish two coast guard stations, one in Tamil Nadu and the other in Orissa, he said. "We will choose either Nagapattinam or Tuticorin in Tamil Nadu and Gopalpur has been chosen for Orissa," he said. They had requested the state government to provide land for the facility,he said. The full-fledged station would help coast guard operate bigger ships,interceptor vessels and others.A Communication centre would also form part of the Station. The Commander said five acres of land would be required for the establishment of the Station.